National Security Scandal Emerges as CBS News Joins Google/YouTube, Wikipedia, UBM, iReach, and PR Newswire in Creating EbolaGate: Media Censorship of Dr. Leonard Horowitz and His Bestselling Book Emerging Viruses: AIDS & Ebola–Nature, Accident or Intentional? Honolulu, HI (Sept. 13, 2014) A National Security scandal–Ebolagate–has emerged as CBS News blatantly censored the name of a famous author and diplomat whose book is credited for growing fears about vaccine safety and the man-made origin of Ebola and AIDS. Evidencing commercial crime, gross media bias, and deadly propaganda, akin to evidence tampering by concealment in law, the name of Dr. Leonard Horowitz, and his American bestselling book, Emerging Viruses: AIDS & Ebola, Nature, Accident or Intentional?, was purposely censored by CBS editors in an article by “Benjamin ‘Fearnow,’” spinning news about the Liberian Observer article that favorably featured Horowitz’s work questioning Anglo-American military involvements in Ebola’s origin and outbreaks. The CBS censorship follows weeks of organized criminal efforts to conceal Dr. Horowitz’s identity, and the Harvard-trained expert’s 3-year scientific study of the origin of AIDS and Ebola. The doctor’s book received international acclaim, including endorsements by numerous Western military and intelligence industry officials, and caused a serious stir when President Barack Obama’s minister, Rev. 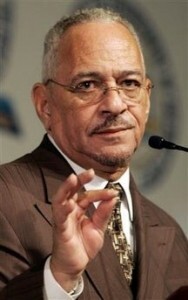 Jeremiah Wright, acknowledged the tome during “Wrightgate”, resulting in the President distancing himself from his minister for his stance on AIDS being a genocidal attack against people of color. “Emerging Viruses: AIDS & Ebola-Nature, Accident or Intentional? is unquestionably an excellent book. It reads itself; and presents a complex topic-the origin or AIDS and Ebola-as concise and authoritative as an executive decision paper. But, it is much more than mere grammatically arranged words and ink consigned to paper. . . . [it] is a life’s work that would do honor to its author as literature, as research, as scientific analysis, as medical philosophy, as government oversight, as criminal detective investigation, or as a spell-binding (covert/political agency run-amok in medical-science) genre novel. . . . In my estimation Dr. Horowitz has unearthed a covert operation run amok that is bigger than any secret operation in U.S. history, and more momentous in its implications to humanity than the atomic weapons “Manhattan Project” of World War II. . . . MANDATORY READING. Immediately following the Ebola outbreak, news censors “black listed” Horowitz and mention of his book, evidencing intelligence industry foreknowledge of the unprecedented international spread of the “outbreak,” and an organized criminal conspiracy to loose Ebola for commercial gain by drug industrialists working with media censors and “spin doctors” at the CIA. 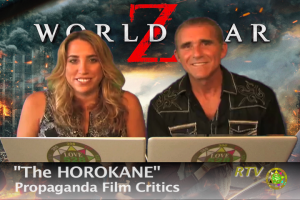 Click to purchase a download of this uplifting film. Wikipedia had libeled the doctor for a decade, attempting to discredit him as a “conspiracy theorist,” similar to the CBS News story by Fearnow (a name Horowitz suspects is “contrived”). Officials at the “non-profit” (purportedly “public edited”) Wikipedia published a bogus excuse for their sudden Horowitz censorship, purposely neglecting the doctor’s credentials as a world-leading, best-credentialed, and most prolific vaccine risk analyst. For a decade before censoring his disparaging bio, Wikipedia blocked the doctor’s efforts, as well as efforts by many others, to correct misrepresentations and omissions; downright fraud in law. 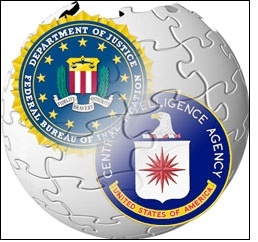 Wikipedia (and the CIA) clearly do not want you to know that the doctor is an award-winning author of 17 books, award-winning film producer with 5 documentaries, founder of the “528LOVERevolution” shattering the medical paradigm with “medicinal music” tuned to the frequency of oxygenating chlorophyll, and developer of OxySilver–the world’s first broad spectrum anti-viral and anti-bacterial “Holy Water” designed to be used with prayer. Horowitz’s supposed “lacking credentials” has inspired natural healers, scientists, and religious leaders worldwide to integrate his pioneering achievements. 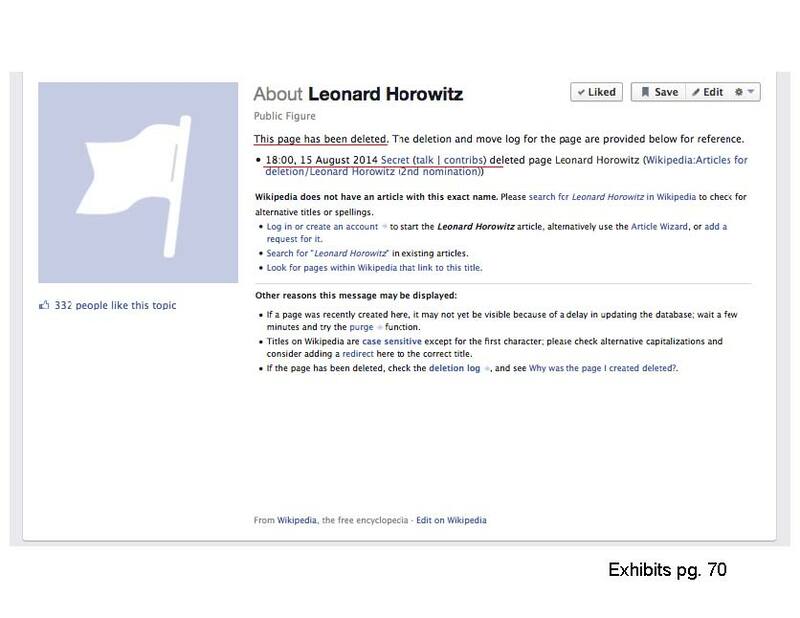 Click to read Wikipedia-Editors Discuss Terminating Dr. Horowitz’s Biography in Advance of Ebola Headlines–the “secret” talk among Wikipedia editors. The lead editor, who voted to maintain and expand Dr. Horowitz’s biography, was out-voted! Wikipedia’s undeserving subject, Horowitz, was officially certified by the U.S. Department of Foreign Affairs, Trade and Development Canada as a apostilled Ambassador-at-Large, for Canadian and Russian organizations advancing the World Organization for Natural Medicine (WONM), Clinics-for-Humanity Project. So Wikipedia has actually libeled, and now censored, an official foreign Diplomat, Ambassador, and public Minister, named “World Leading Intellectual” by his peers in natural medicine, as well as the Editor-in-Chief, of Medical Veritas International, Inc.’s online journal. The Wiki-prostitutes are clearly biased against Horowitz for the simple fact that he has been a “thorn in the side of the drug cartel,” extremely critical of vaccines; especially those “fast tracked” by government officials with conflicting financial interests in the pharmaceutical industry, following the extortionate release of Ebola from a BigPharma biowarfare refrigerator. 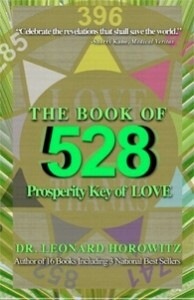 The doctor is also an award-winning author of 17 books, award-winning film producer with 5 documentaries, developer of OxySilver–the world’s first broad spectrum anti-viral and anti-bacterial “Holy Water” designed to be used with “prayer power,” founder of the “528LOVERevolution” shattering the medical paradigm with “medicinal music” tuned to the frequency of oxygenating chlorophyll; who has been an inspiration to recording artists worldwide who are now re-tuning their instruments and voices to the “medicinal frequency of LOVE/528” following publication of Horowitz’s The Book of 528: Prosperity Key of LOVE, and his official certification by the U.S. Department of Foreign Affairs, Trade and Development Canada as a apostilled Ambassador-at-Large, for Canadian and Russian organizations advancing the World Organization for Natural Medicine (WONM), Clinics-for-Humanity Project. So Wikipedia libeled, and has now censored, an official foreign Diplomat, Ambassador, and public Minister, as well as the Editor-in-Chief, of Medical Veritas International, Inc. 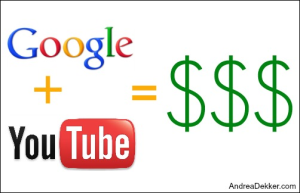 Similarly evidencing an organized criminal conspiracy to conceal evidence of liability for the AIDS and Ebola outbreaks, secure a monopoly for the pharmaceutical industry over healthcare, and kill people under the guise of “vaccine safety” and emergency management of outbreaks and pandemics, Google/YouTube removed Horowitz’s channel containing more than 150 videos, including his productions of: 1) “Merck Chief Brings HIV/AIDS to America” viewed by more than a million people, all shocked by the world’s leading vaccine developer, Dr. Maurice Hilleman, and his production assistants from WGBH, Boston, laughing over bringing the AIDS virus to America in contaminated animals shipped precisely as Horowitz evidenced, by Litton Bionetics, a leading U.S. military bioweapons supplier; and 2) “Robert Gallo: The Man that Created AIDS” viewed by more than a half-million people, wherein Horowitz slammed Gallo for lying at the XI International Conference on AIDS, concealing his National Cancer Institute (NCI), Special Virus Cancer Program (SVCP), assignment overseeing Litton Bionetics’s immune system destroying virus developments. Dr. Horowitz believes that his shocking book is being censored for his having reprinted U.S. Government/National Institutes of Health NIH)/NCI contracts proving AIDS-like and Ebola-like viruses were irrefutably genetically engineered using crude mutation techniques in biowarfare and vaccine development labs during the 1960s and early 1970s, a claim that Robert Gallo denied, despite Horowitz having Gallo’s incriminating contract(s). “Jurors will need to adjudge the transparency of the NSA/CIA/media conspiracy to defame me, censor my books and films, steal my properties, destroy my family, and ruin my businesses and professional relationships, as a ‘protection racket’ for Big Pharma and the War Cartel,” Dr. Horowitz said. Click to View this Free Special Report on Ebola Now. The fallacy in this reasoning and racketeering is that animals do not kill for sport or financial reward. Without the extinction risks imposed by war makers and drug dealers, Nature has always thrived, always restored balance and harmony by “Divine (intelligent) design”–more intelligence concealed and discredited by the same forces loosing Ebola from labs and libeling Dr. Horowitz’s heroism.